Travelling around the world is a dream for many people and often they believe it is out of their reach, but with careful planning and disciplined budget management, it is possible to achieve on a shoestring. Determination, adaptability, a friendly smile and steely resolve are required, it’s definitely not for the fainthearted. 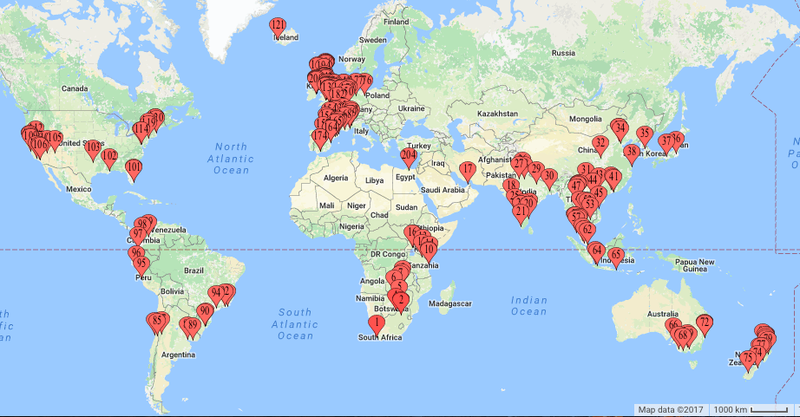 We visited 37 countries and travelled through 3 more over 713 days away from home. Plus we stopped in UAE, Iceland and Egypt on flight stopovers. 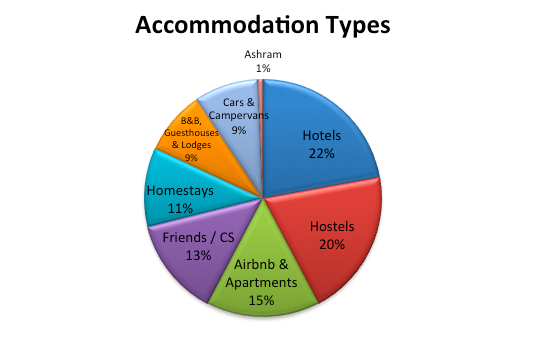 This chart illustrates our expenditure by category, bearing in mind our actual cost was for two people, and in many instances, we could not always CouchSurf as a couple and the cheap hostel rates did not benefit us massively, as they are nearly always at a per single bed rate, not per room. Those of you who know us well, will know that we kept accurate records of every dime, cent, rupee, kwacha, yen and dollar we spent on our journey. We had developed a daily budget before we departed, which, we reduced significantly due to the falling South African Rand and we wanted to meet our two-year timeframe, for a whole number of reasons. 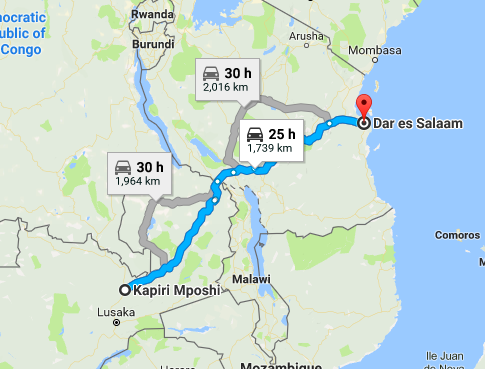 It would have been possible to visit more places, but the costs of flying would have increased our expenses, so we used overland transportation wherever possible and got the cheap flights, when absolutely necessary, besides that could have made our travels a complete blur of places and lacking in experiences, except for airports. 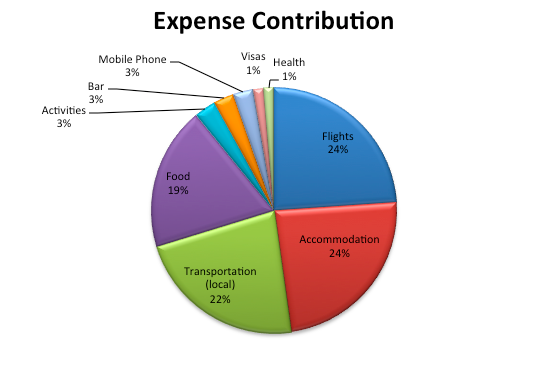 Reaching the USA then Europe as the last two major regions of our trip was expensive and we saw our expenses increase rapidly during the final months, we had envisaged and accounted for this in our planning stages. We stayed for free at many places in exchange for volunteering or CouchSurfed or by the grace of good family and friends, we stayed with them and in some circumstances, we slept in our transport, which when we planned our travelling across long distances, the night bus or train served as a saving in accommodation as well and sleeping in a cheap rental car, although saves on accommodation costs, plays havoc with your back and shoulders. The Best Deal other than family and friends was a night in the Radisson Blu, Bangkok for free thanks to some Club Points. We ended up less than $1 over our daily budget rate, which considering the difficulty in developing such a budget, let alone adhering to it, is pretty good. We used USD as our go to and planning currency, as it’s widely understood and referred to globally, plus we needed to fix our budget to something other than our South African Rand. Hey, Cambodia uses USD as their local currency as well. 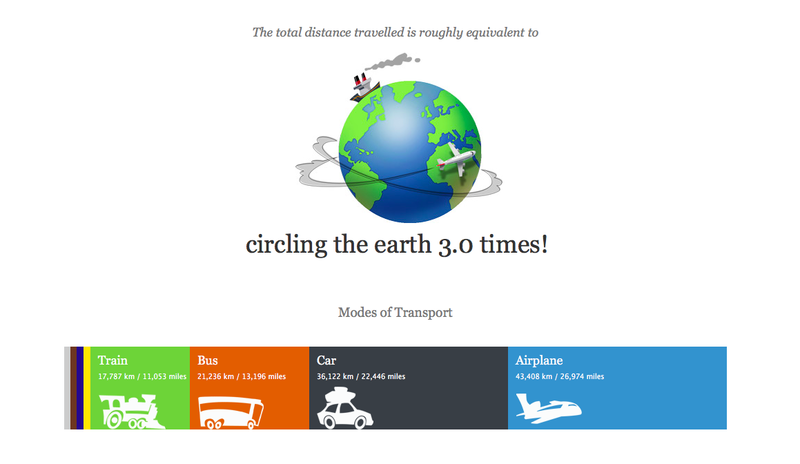 We travelled 81,740 recorded miles or 131, 547 km that’s the equivalent to more than 3 times around the circumference of the earth, excluding walking distances and local bus rides, car rides, trams, trains and metros that we did. 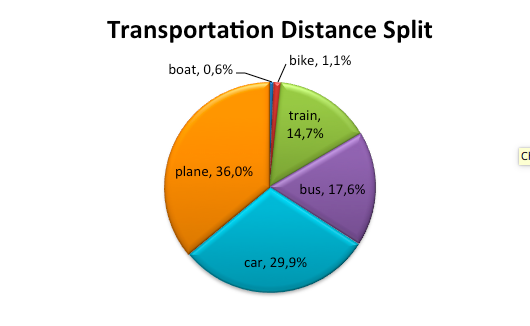 WHAT TYPES OF TRANSPORTATION DID YOU USE? HOW MANY NEW FRIENDS DID YOU MAKE? I kept a comprehensive contacts list of all the friends we made, whether we lived with them for a month or only had an evening together, we made more than 250 new friends, but this is a false indicator because our friends cannot be measured. HOW MUCH TIME DID YOU SPEND VOLUNTEERING? 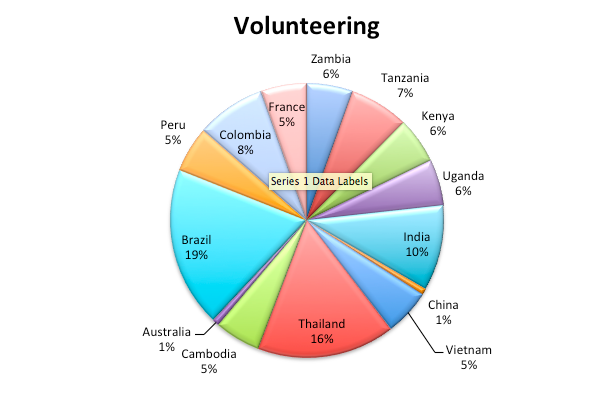 We volunteered for 258 days at 16 different locations in 14 countries, the below chart illustrates the contribution to the overall time we spent volunteering. 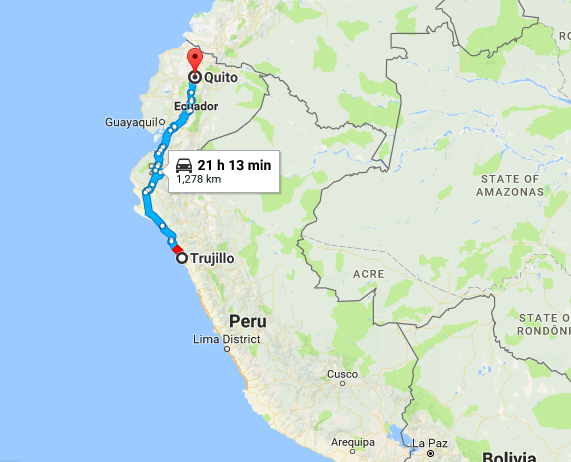 Well, there are two that spring to mind; in duration and combined with hardship, where we sat in one seat, except during the border crossing, was on a bus from Trujillo, Peru to Quito, Ecuador a distance of 1278 km or 794 miles which took us 27 long hours. 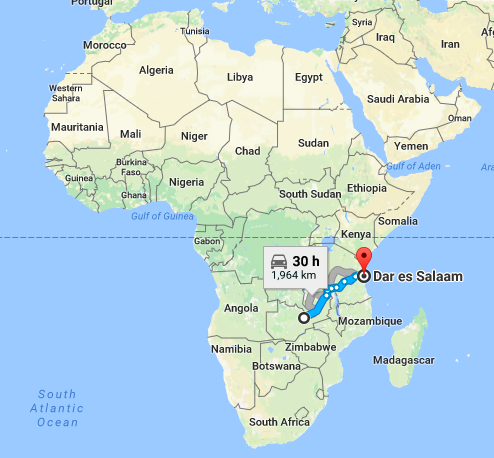 The other journey was from Kapiri Mposhi, Zambia to Dar es Salaam, Tanzania was via express train and scheduled to take 36 hours, yet due to the train drivers desire to stop at virtually every station on this 1964km or 1220 mile journey, it actually took 3 grueling days. 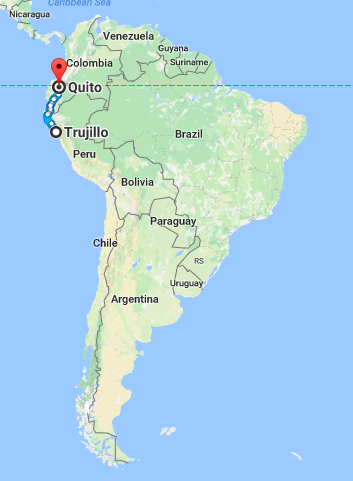 The statistics will never tell the true story of our adventure, as measurements like this are not of true value, the experiences and learnings we had, are immeasurable for ourselves.